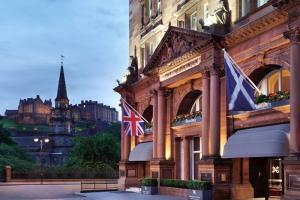 This luxury hotel is a historic icon in the heart of Edinburgh. Located on Princes Street, the hotel features more rooms overlooking Edinburgh Castle than any other hotel in the city. 241 spacious and elegantly-appointed guest rooms and suites offer a relaxing retreat at the end of a busy day. Enjoy eclectic French cuisine at The Pompadour by Galvin and Galvin Brasserie de Luxe, from renowned Michelin-starred chefs Chris and Jeff Galvin. The hotel is walking distance to the town’s financial and shopping districts and popular attractions including Edinburgh Castle, Scottish National Gallery, and Holyrood Palace are less than two miles away. Located on Princes Street, approximately 8 miles from Edinburgh airport. The hotel is easily accessible from both Haymarket and Waverley train stations. Edinburgh Castle, Edinburgh Old Town, Scottish National Gallery, Holyrood Palace, The Georgian House Edinburgh, Royal Mile, and the Edinburgh Town Walls.